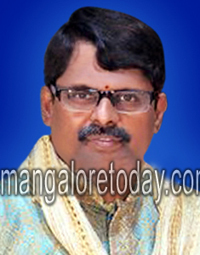 Mangaluru, Mar 26, 2015 : In an incident that has come as a shock to many, Gurupur’s famed textile merchant Gajanana Prabhu (55) has reportedly committed suicide. He was found hanging from the ceiling fan in his residence on March 26, Thursday morning.The reason that drove him to the extreme step is not known. Prabhu owned the Central Cloth Store at Gurupur town. Known for its wedding sarees and dresses, people from far and near used to visit this shop for wedding related purchases. It has been gathered that he was quite normal on March 25, Wednesday night and was found talking to someone on his cell phone till 10 pm. Prabhu has left behind his wife and a daughter. He was also serving as the District Merchants’ Association President. A case has been registered by Bajpe police.